Overall, I enjoyed Senior Year Bites. It was a lot of fun and a really quick read. I stayed up a little late to finish reading it, because I wanted to see what happened. I had a few issues, but I still ended the book with a smile on my face. Most of my problems were that there were some unbelievable parts and I just couldn't suspend my disbelief. When kids start showing up dead around town, Meg's friends (who don't know that she's a vampire) just go along with the assumption that the suspect is a supernatural creature. My first thought regarding dead bodies in real life, even those drained of blood, would be that it is an insane person that either is doing something ritualistic or thinks he/she is a vampire, not that the person is actually vampire. There was also no addressing that everyone Meg bit would have bite marks the next day or that biting someone would be a messy endeavor that would require cleanup. 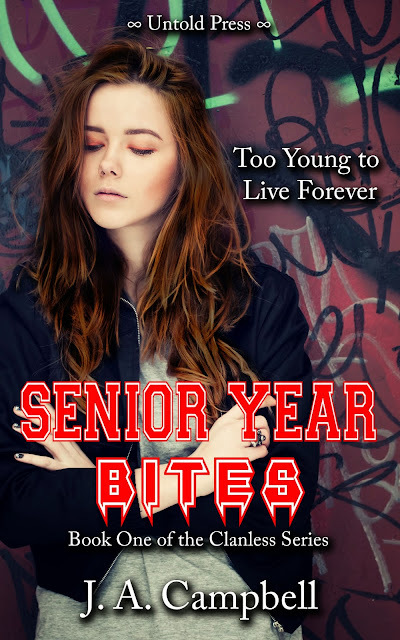 Other than my nitpickiness, Senior Year Bites was a cute story, and there was no teenage angst! There is a little bit of angst, but it's more in the best friend variety than the boy variety. It also gets cleared up rather neatly. Meg and friends do have some cute boy romances, but the romance and courtship is just sweet and comes about naturally. Because Meg's maker pretty much leaves her for dead (undead? ), we don't really get any information on the vampire world, except for what Meg figures out on her own. Another supernatural creature or two show up later, and Meg gets a little bit of information, but I still want to know a lot more about the supernatural world. Also, there were some loose ends that didn't get resolved. I don't know if that was intentional and a set up for book two (like did Ann's new friends show up in town coincidentally or was there a reason they showed up at the same time that Meg was turned? ), or if those will just be unanswered questions. I would recommend Senior Year Bites to anyone looking for a cute, light YA paranormal with enjoyable characters and little to no YA relationship angst. To satisfy FTC guidelines, I am disclosing that I each received a copy of the novel from the author in exchange for an unbiased review.